Develop your science skills by making regular observations of bluebirds in a nest box. Erect a bluebird box on your home or school property. Lots of plans are available to make your own nestbox . There are also many sources for prefab boxes. Not all boxes are really appropriate for bluebirds. Check the expert's plans to be sure a pre-made one is the right dimensions. Pay special attention to the diameter of the entrance hole. Learn why you should be picky about your box's dimensions. You could consider posting several different kinds of nest boxes to see which attracts the birds. Download this great Nest Box Logs. Make regular observations. Document your observations. Answer the questions in the logs. Come to a conclusion - Is the species you are observing: thriving / holding its own / threatened in your area? How does this compare with other people's observations at NestWatch? Based on this status what actions do you recommend? Observe using an online nest box cam. Cornell University provides one. Several other ones are available online. Use your search skills to find one close to your area. 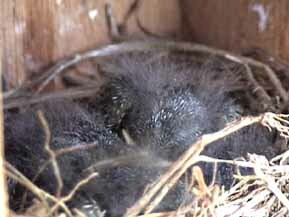 Bookmark the nest cam's web page to make it easier to regularly check it. Observe daily. Document your observations. Answer the questions in the logs. You could even set up a web cam yourself! Aligned with Pennsylvania Academic Standards for Science & Technology , Ecology & Environment, Mathematics, Reading & Writing.